Duchenne Muscular Dystrophy has invaded our lives. Our 4-year-old son, Alex, was diagnosed with this incurable, horrendous disease in February 2018. It’s been a VERY rocky, trying year. My wife and I have gone through an emotional rollercoaster that is more jarring, life-altering and messy than the world’s fastest amusement park rides. We’ve gone through spouts of depression. We’ve gone through periods of rage. We’ve gone through heartbreak as we think about our only son and the path that lay ahead. 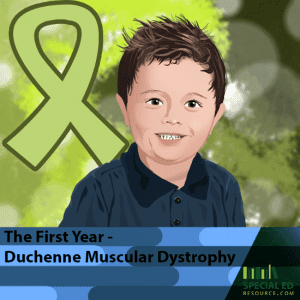 Duchenne Muscular Dystrophy (DMD) is a degenerative muscle disease. This means that a protein that a “normal” body produces to repair and build muscles does not exist in people with DMD. When “normal” people work out or do something to cause exhaustion in muscle tissue, the body comes to the rescue and builds that muscle back up. Often bigger and stronger than before. In people with Duchenne Muscular Dystrophy, their bodies don’t come to the rescue, the muscles simply scar. Duchenne Muscular Dystrophy affects every single muscle in the body. That’s right, ALL of them. By age 10, most children can no longer walk as their leg muscles can no longer support them. Slowly other muscles follow and eventually the heart is no longer able to keep going. What’s it like receiving the life-altering news that your little boy has a hellacious, incurable, fatal disease? No way, not possible, why him? Why us? He seems totally fine. I cried A LOT. Any time I wasn’t around anyone, my eyes turned to into Niagara Falls. Uncontrollable emotion. Reality (same time as depression). I realized if a cure is not found… I will be forced to bury my son. No parent should EVER have to bury a child; the natural process is not designed to be that way! There is no God that would put a child or family through this, I thought. How could He? Take a happy, adorable, funny, loving boy and force him to live his life in pain and slow regression… why? What purpose does that have? We told our close friends and family, nothing more. We didn’t want to feel “needy” or give the wrong impression that we were looking for handouts of any kind. Fighting through something like this alone is draining. My wife and worked through much of the initial year in our own private way. Good idea…? Nope. We are learning and becoming stronger now since we have begun the reflection process. The meaning of life changes when news like this comes through the doorway of your family. Things that were important, no longer are. Things that seemed small and unimportant suddenly become the centerpiece of your lives. The biggest one? Time. There is a God, and there is a reason for all life has in store for us. Things happen to every single individual on this planet. Some big, some small, some extremely challenging, some not-so-much. We have ZERO control over what happens when it happens, where it happens and how it happens. We do have total control over what we do with the “opportunity” we have been given. Almost a full year after the diagnosis, I spoke in length with the mother of a 19-year-old young man who has Duchenne Muscular Dystrophy. This was the first time ever speaking with another parent within the Duchenne community. My mind was blown, and 99% of me wishes I would have had that conversation almost a year ago. The 1% wonders if I would have been in the right place to hear what she had to say. However, it helped more than I could ever describe to anyone. Thank you, Jill! We’ve also immersed ourselves in an incredible community called Parent Project Muscular Dystrophy (PPMD). Other groups are amazing as well… MDA is another. The community we’ve helped build at Special Ed Resource has been absolutely incredible as well! Suzie and I feel so blessed to be surrounded by such caring, compassionate, understanding and empathetic people! Thank you! We cannot change the diagnosis; we can only move forward TOGETHER with a plan. Our son needs us, and we need each other… we got this! We are starting year two now which has been much better. We have purpose and meaning within all of the madness. We are dedicated to raising awareness which will lead to a cure for Duchenne Muscular Dystrophy! Together we actually live life instead of merely going through the motions of the day-to-day. We’ve mostly eliminated the “someday” mentality and work toward doing all that we can NOW… in the moment. If you’re struggling with a similar diagnosis within your family, it’s okay. You are not alone. Utilize the community, don’t fight it, stick together and most importantly don’t look too far ahead. Lots of things change as technology advances, and our whole way of life will most certainly look different in 10-20 years. For us, staring into the future as it exists today is entirely counterproductive and, in fact, not accurate. As an example, 15 years ago there were zero clinical trials as potential cures for DMD, now there are currently dozens of active trials. 15 years from now? Cure? YES… that’s the plan! Above all else, don’t miss out on life, don’t be preoccupied, just be in the moment always. This entry was posted on Monday, January 28th, 2019 at 4:02 pm and is filed under Special Education - Parents View and tagged as Advocacy, Luke Dalien. You can follow any responses to this entry through the RSS 2.0 feed. A diagnosis of Duchenne Muscular Dystrophy does NOT mean the end of the world. It feels that way during the first year, but when everything is put into perspective… it becomes a life-altering challenge that CAN build a family up. Again, much easier said than done.